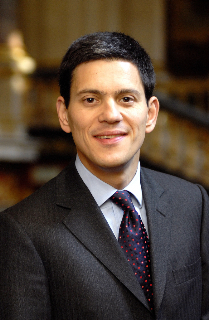 David Wright Miliband (born 15 Julie 1965) is a Breetish Labour Pairty politeecian wha wis the Secretar o State for Foreign an Commonweel Affairs frae 2007 tae 2010  an the Member o Pairlament (MP) for South Shields frae 2001 tae 2013. ↑ Wheeler, Brian (29 September 2010). "The David Miliband Story". BBC News. Archived frae the oreeginal on 22 May 2013. Retrieved 29 September 2013. ↑ "David Miliband — Somerville College Oxford". www.some.ox.ac.uk. Retrieved 2016-05-24. This page wis last eeditit on 18 Juin 2016, at 02:10.